Since 1980, Make-A-Wish has granted hundreds of thousands of one-of-a kind wish experiences worldwide. Here, in the Texas communities we serve, we are focused on being able to grant the heartfelt wish of every eligible child battling critical illness. Wishes have proven physical and emotional benefits that can give children with critical illnesses a higher chance of survival. With a wish a child replaces fear with confidence, sadness with joy, anxiety with hope. Together we can ensure EVERY eligible child has a wish to count on. Learn more at ntx.wish.org. 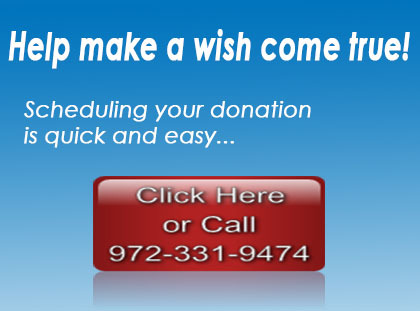 Make-A-Wish® North Texas creates life-changing wishes for children with critical illnesses. Wishes have proven physical and emotional benefits that can give children with critical illnesses a higher chance of survival. With a wish a child replaces fear with confidence, sadness with joy, anxiety with hope. Together we can ensure EVERY eligible child has a wish to count on. Learn more at ntx.wish.org. To grant the wish of every eligible child.